Originally the product supported VMware environments, Zerto added support for Microsoft Hyper-V, Amazon’s AWS, and Microsoft Azure, making it the only BC/DR software platform designed to enable hybrid cloud application mobility and protection. The company’s solution, Zerto Virtual Replication, enables seamless flexibility and manageability of data and applications whether they reside on-premise, at any cloud service provider or on a combination of both – known as ‘hybrid-cloud’. This is the premise behind Zerto’s Cloud Continuity Platform, delivering a datacenter in which all applications have the ability to span on-premise and cloud datacenters, and can be managed and accessed from anywhere, regardless of underlying infrastructure. The goal for Zerto is to empower IT to make decisions on just two decision points – service level and price. This is the premise behind Zerto’s Cloud Continuity Platform, delivering a datacenter in which all applications have the ability to span on-premise and cloud datacenters, and can be managed and accessed from anywhere, regardless of underlying infrastructure. The goal for Zerto is to empower IT to make decisions on just two decision points – service level and price. Zerto Virtual Replication Enterprise Cloud Edition provides continuous block-level replication to up to 3 sites with automated failover, failback and non-disruptive DR Testing. Enabling true hybrid cloud, IT can leverage another site within their organization, Amazon Web Services, Microsoft Azure or leverage of our many Cloud Service Providers. Replication between VMware vSphere and Microsoft Hyper-V delivers more flexibility and agility within the environment while delivering a consistent platform for application portability. Recovery from any disruption including ransomware is simple as users can simply select a previous point time an essentially “undo” the attack. Zerto offers granularity in the recovery with the ability to recover files, VMs, applications or entire sites. Disaster recovery plans are automated at the application level with the ability to configure boot order, re-IP on failover eliminating manual process and the opportunity for errors in high-pressure situations. Zerto Virtual Replication is the industry’s first enterprise class disaster recovery solution from on-premise to Amazon Web Services (AWS) or Microsoft Azure. This critical capability fulfills the Cloud Continuity Vision with consistent and continuous replication of production workloads from VMware and Microsoft environments to AWS or Azure, delivering more options for disaster recovery. By leveraging AWS or Azure for the target site, capital costs are dramatically reduced and replaced with a predictable monthly service. Lastly, the time to acquire and configure hardware is eliminated, making it easy for IT to quickly meet changing business requirements. Zerto Virtual Replication delivers continuous block-level replication on a single hypervisor. Recovery Point Objectives are measured in seconds while recovery time objectives are measured in minutes. Automated failover, failback, and non-disruptive DR testing ensures consistency in high-pressure situations. 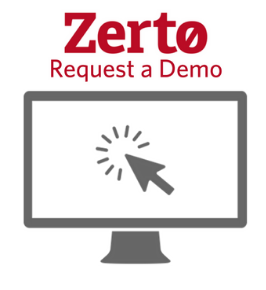 Ready to see Zerto in action, request a demo today!